When it comes to fast trains, Japan takes top honors. A trailblazing maglev - short for ‘magnetic levitation’ - train has set a world speed record during a test run near Mount Fuji, clocking over 600kph (373mph). The new record comes less than a week after the seven-car train clocked 590kph, breaking its own 2003 record of 581kph. 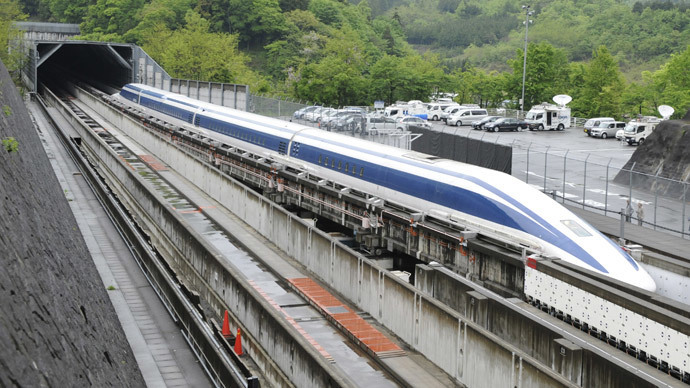 The maglev hovers 10cm above the tracks and is propelled by electrically charged magnets. The challenge for the Japan Railway Central company is to have a train in service in 2027 to travel some 286km between Tokyo and the central city of Nagoya. The service, which would run at a top cosmic speed of 500kph, is expected to connect the two cities in 40 minutes. It's less than half the present journey time for the Shinkansen bullet trains. By 2045, maglev trains are expected to link Tokyo and Osaka in just one hour and seven minutes, slashing the journey time in half, the Japan Times reported. Meanwhile, construction costs for the dedicated lines have been estimated at up to $100 billion for just the stretch to Nagoya, with over 80 percent of the route set to go through pricey tunnels. Japan wants to sell its Shinkansen bullet and magnetic train systems overseas to revive the country's economy, partly through infrastructure exports. Prime Minister Shinzo Abe is likely to push the technology for a high-speed rail link between New York and Washington during his upcoming visit to America this weekend.